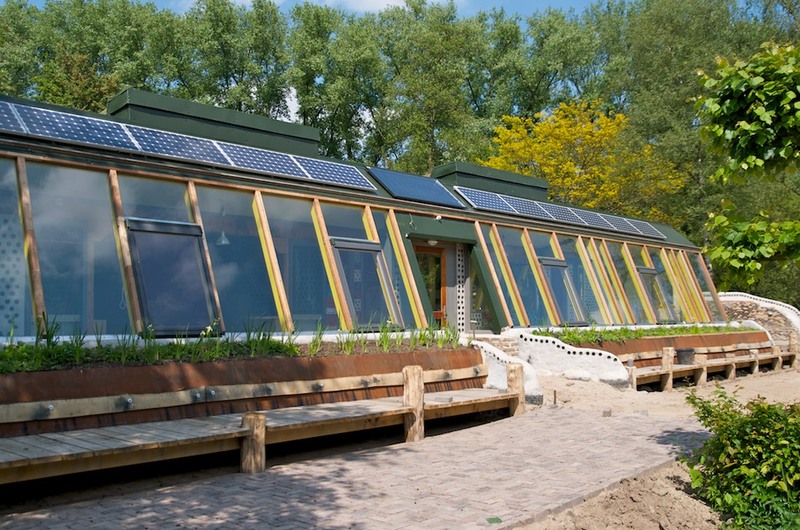 Super Sustainable Buildings via Thermal Dynamics & Passive Solar. An Earthship is a type of passive solar house that is made of both natural and upcycled materials (such as earth-packed tires). Earthships can be completely off-grid or partially off-grid. 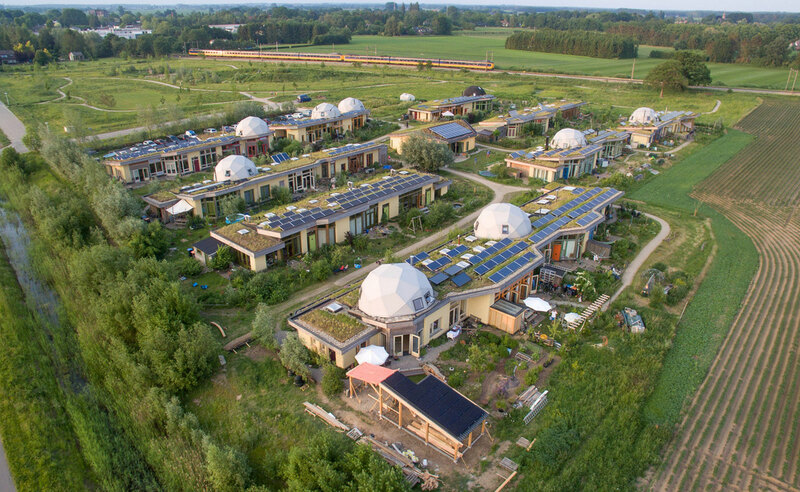 Earthships can be built in any part of the world, in any climate (with a permit) and still provide electricity, potable water, contained sewage treatment and sustainable food production. Earthships are thermal mass homes first, passive solar homes second. 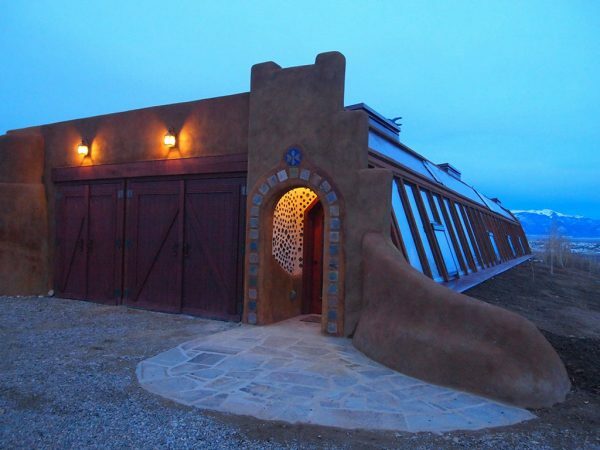 Whatever temperature goes into an Earthship, it will hold… and since it is also a Passive Solar House, it is also very tight and interacts only with the sun and the earth for heating and cooling, providing stable comfort year round in any climate. 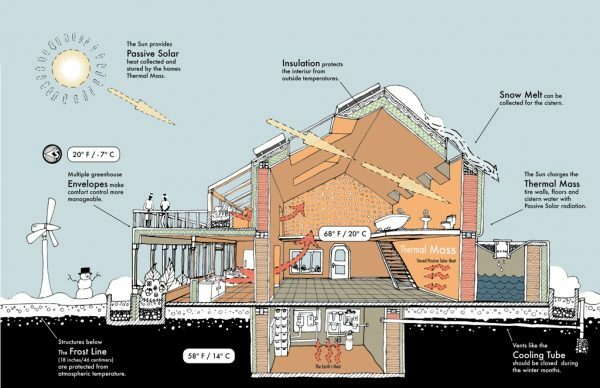 This results in being able to provide a sustainable home on property that may not be situated to the ideal of 13.5 degrees east of south. 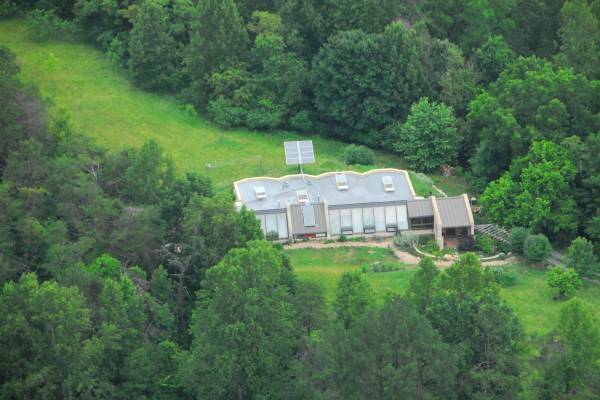 electricity: off-grid, grid-intertie. Solar, Wind, Biodiesel, Geo-Thermal, Micro Hydro. Contain & Treat Waste Water. 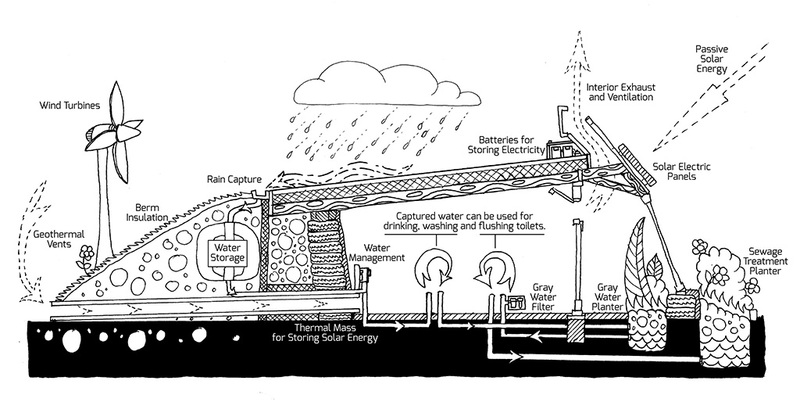 Treat and clean greywater. 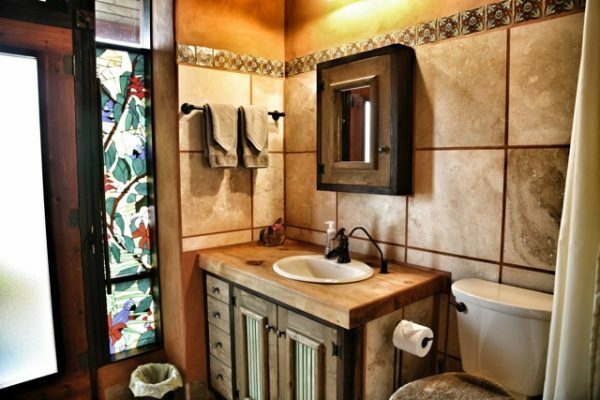 Flush toilets with treated greywater, clean and clear. Improves and adds to conventional systems without replacing. Liquid Waste Water Planters provide for prolific Food Production. 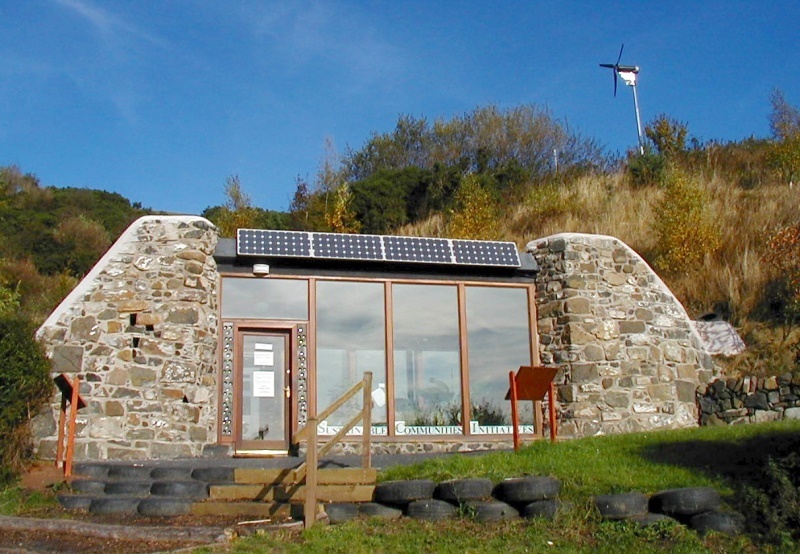 A sustainable home must make use of local (indigenous) materials, those occurring ‘naturally’ in the local area. 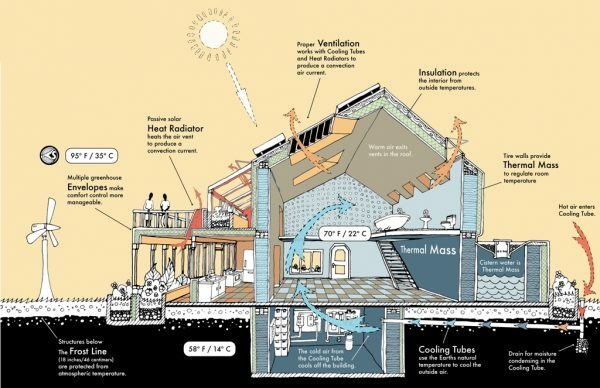 Generally speaking, a sustainable building with the methods outlined uses about half as much fresh, potable, drinking water as a conventional building. 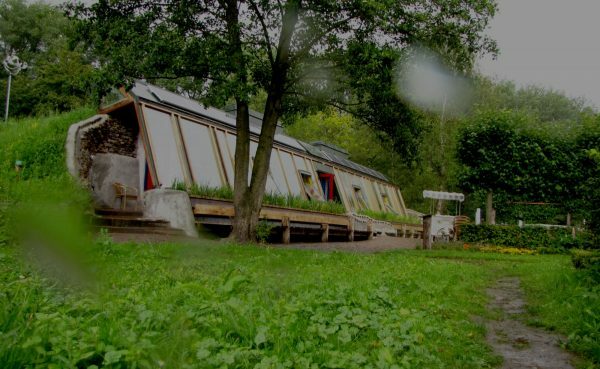 Earthship wetlands, the planters that hold hundreds of gallons of water from sinks and the shower are a great place for raising some of the fresh produce you'd like to have in the winter, but find expensive or bland tasting from the supermarket. 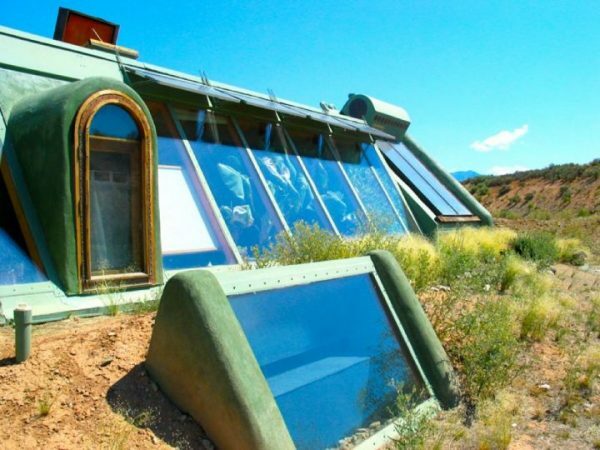 Earthships use interior greenhouses for treatment of grey water, as well as to grow food and enhance the natural beauty of the home. 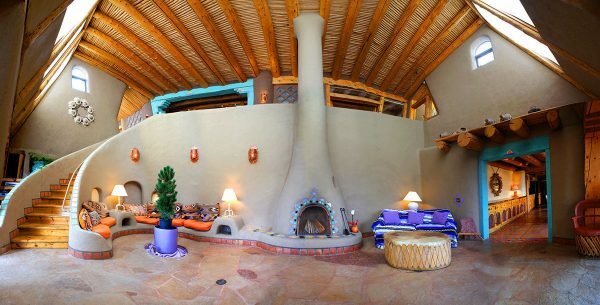 The risk of living in an earthship tire building would be several orders of magnitude lower than the risk posed by activities such as living in a house with new carpet, eating peanut butter, driving a car, or smoking cigarettes. Our most universal model for the developed world is the Global Model. It can be modified for almost any climate and comes in many sizes. It can also come in custom sizes. Two-bedroom, Two-bathroom Vaulted Global Model Earthship. 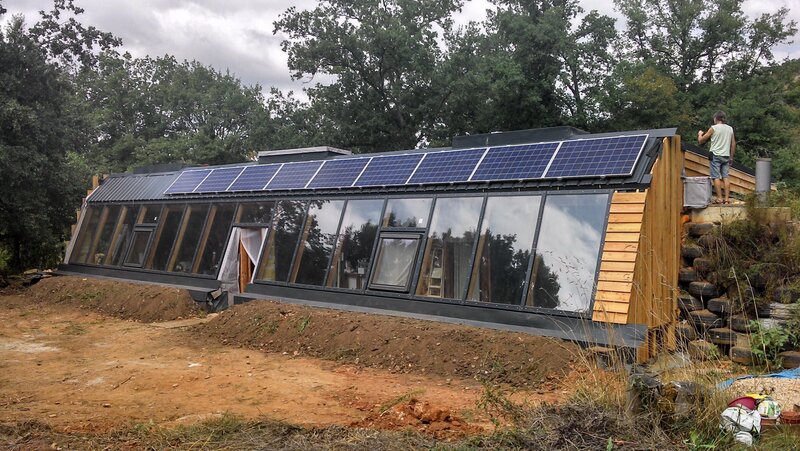 The latest Earthship design. Better, more efficient in terms of performance and construction. 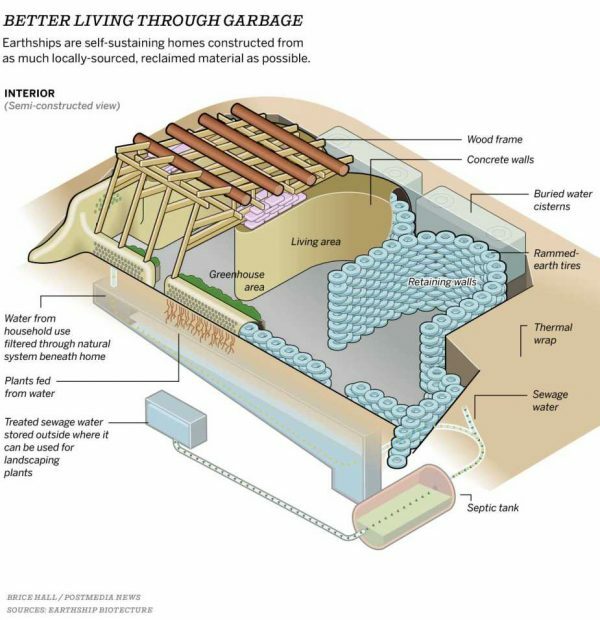 The Simple Survival Model Earthship evolved from the very basic prototype we constructed in Haiti. The purpose of the original Haiti build was to reevaluate the concept of necessity. 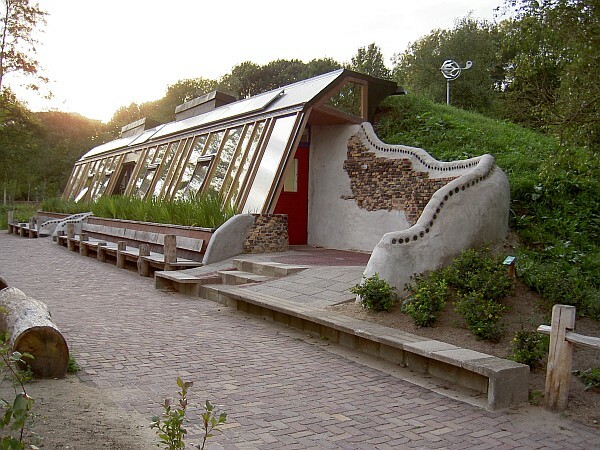 A very simple and economical version of the Earthship concept in terms of construction and building. Pre-designed drawings and partially prefabricated construction packages available. Each tire bale measures approximately 5’x5’x2-1/2′ high, with approximately 120 compressed tires. They weigh about 1 ton each, and are stacked like bricks. All tire bale walls can go up on 2 – 3 days. A Typical Tire Bale Earthship at 2,200 square feet will use approximately 20,000 tires. 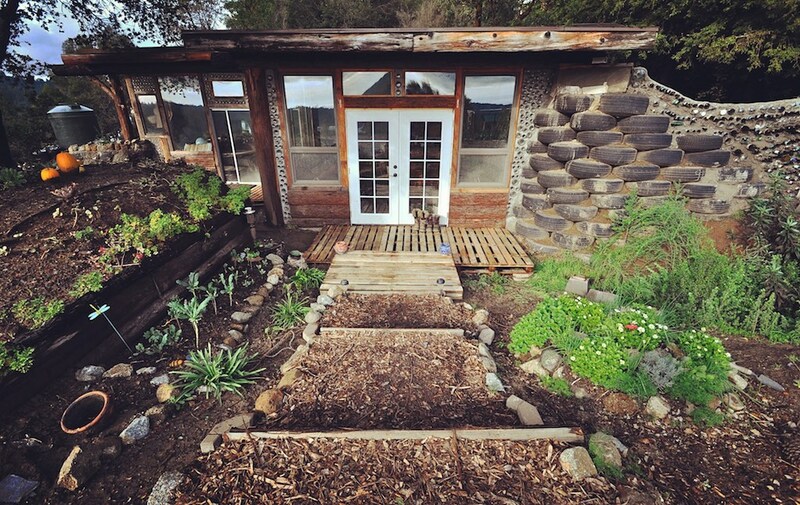 In the earthship building process, scrap tires rammed full of compacted earth are used to construct building walls. 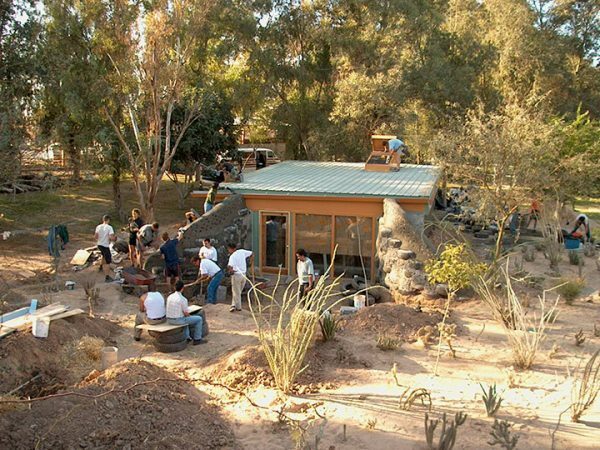 It is also possible to construct building walls from compacted bales of scrap tires, or tire bales. The same method for building structural walls in buildings can be applied when building retaining walls made with rammed earth encased in steel-belted rubber. Depending on the load the retaining wall is retaining, the batter and other adjustments should be considered. Let us help you make your dreams come true. 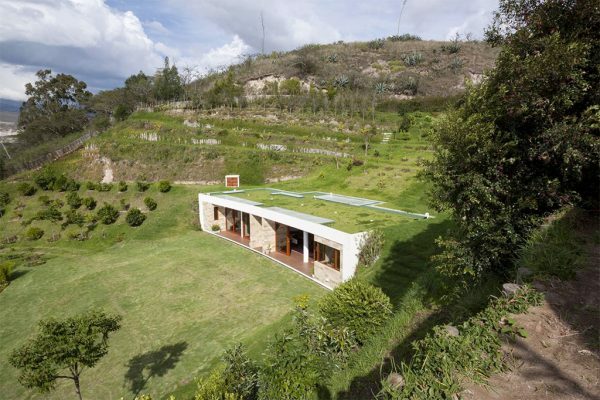 When you are ready for a professional firm to guide you into the world of truly sustainable living, give us a call.